This VIS image is located in Terra Sirenum. The bright linear feature at the bottom of the image is the crest of a ridge. 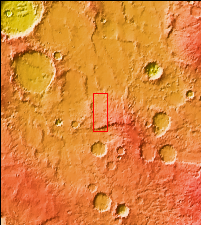 The multiple channel features toward the top of this image were created by liquid flow running down slope from the ridge.